Hey, you, with that Instant Pot. Have you tried making oatmeal in it yet? Your new BFF is about to change the way you make oatmeal, and just wait till you see the results. Thick, creamy, perfectly cooked and with hardly any effort on your part, it’s absolutely fool-proof. Go on and give it a try. Just prepare to be dazzled. The instructions are right there in the recipe book that came with your Instant Pot, but you may have overlooked them because they are next to the recipe for Turnip Cake. The book calls this recipe Three-Minute Steel Cut Oats, but the “three minute” part is misleading. It refers to the amount of time that the pot is pressure cooking, not to the total amount of cooking time. I have made this so many times now, I should have timed it start to finish for you, but I am so excited every time I toss the water, milk, and oats in that I walk away and simply forget about it until later when it beeps. Let’s just say it’s not three minutes, but however long it takes you can be doing something else besides stirring a pot. You can use any kind of milk you like here. I always use coconut milk because it is dairy and nut free. You can also add vanilla, cinnamon, and ground cloves, which I sometimes do, but lately I have been just keeping it plain and letting everyone add what they want at serving time. Make this gluten-free by using gluten-free steel-cut oats, which thanks to Bob’s Red Mill, are becoming easier and easier to find at more grocery stores. Covered and refrigerated, leftovers will keep for 4 days. 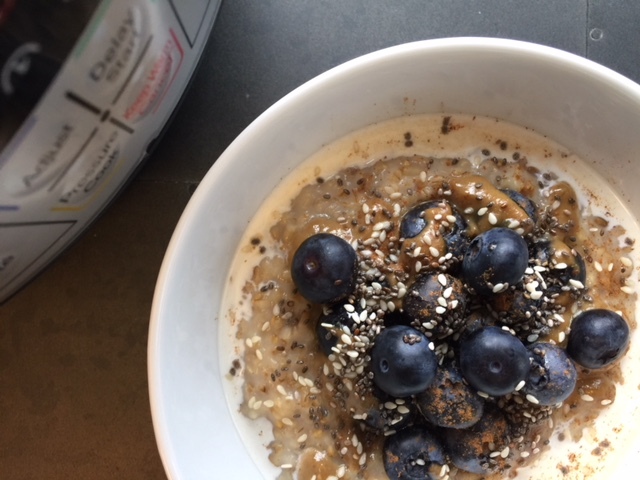 Instant Pot Oatmeal is perfect for brunch or feeding a crowd. You can set it and forget it. Once it finishes it can sit and wait, nice and warm, until you’re ready to serve. What’s easier than that? Add water, milk, oats, pinch of salt and optional ingredients, if using, to Instant Pot. Lock lid. Use “Pressure Cook or Manual” function to cook for 3 minutes. Let sit until pressure releases naturally, if possible. Carefully remove lid, tilting away from you. Stir oats and serve. Once you have washed the inner pot and lid with warm, soapy water, now is a good time for a more thorough Instant Pot cleaning. Add 2 cups of water and a splash of white vinegar and run the “steam” program for 2 minutes. Rinse and dry. Nice, fresh and ready for the next time.